as they do on the Department of Defense? For example, they could entirely build a national network of true high-speed rail. Over the past decade the US has spent $1 trillion on Iraq and Afghanistan while China spent $1 trillion building for the future. In 1946-48, the United States advanced for the first time the view that seizing individuals, holding them for prolonged periods without recourse to law, and subjecting them to torture or humiliating treatment was a particularly serious crime – a crime against humanity. US prosecutors, many of them from the Justice Department, brought charges against government officials who had done this, and secured convictions. Europeans were at first sceptical of these American views, but over time they came to embrace and support them. Today, the view is firmly held around the world that "disappearings" are a crime against humanity and thus not subject to statutes of limitation or capable of being ignored. The CIA just ran into this wall, and this should be a lesson for the Obama Administration: it shows what can happen when the US fails to abide by the values it espouses. A recent US appellate court decision (in Arar versus Ashcroft) reflects vividly what the country has become. Maher Arar is a citizen of both Canada and Syria. A telecommunications engineer and graduate of Montreal's McGill University, he's lived in Canada since he was 17. In 2002, he returned home from vacation; on a stopover at JFK Airport, he was detained by US officials, accused of being a terrorist, held 2 weeks incommunicado without access to counsel, abusively interrogated, then rendered - despite pleas that he might be tortured - to Syria, where he was interrogated and was tortured - repeatedly. He remained in Syria 10 months under brutal and inhumane conditions. In January 2007 the Canadian Prime Minister publicly apologised to Arar for the role Canada played in these events and paid him $9 million in compensation. That was preceded by a full investigation by Canadian authorities and public disclosure of their detailed report concluding "categorically that there is no evidence to indicate that Mr Arar has committed any offence or that his activities constituted any threat to the security of Canada." By stark and revealing contrast, the US government admitted no wrongdoing nor spoke publicly, insisting that courts are barred from examining the conduct of government officials because of "state secrets" - courts can't interfere in actions of the Executive where national security is involved. What does this say about how democratic, accountable, and open the US is? By a vote of 7 - 4 the court dismissed Arar's case in entirety, holding that even if the government violated his constitutional rights and also statutes banning participation in torture, he still has no right to sue for what was done because "providing a damages remedy against senior officials who implement an extraordinary rendition policy would enmesh the courts ineluctably in an assessment of the validity of the rationale of that policy ... directly affect[ing] significant diplomatic and national security concerns." In other words, the government can do anything as long as it's done in a national security context, even violate laws and involve themselves in torture. Courts should honour these actions by refusing to scrutinise them. This is how the character of a country fundamentally degrades when in a state of permanent war - so continuous are inhumane acts of government leaders that citizens lose capacity for moral outrage... A decade ago, the town of New London, Connecticut claimed Susette Kelo’s house by right of eminent domain. 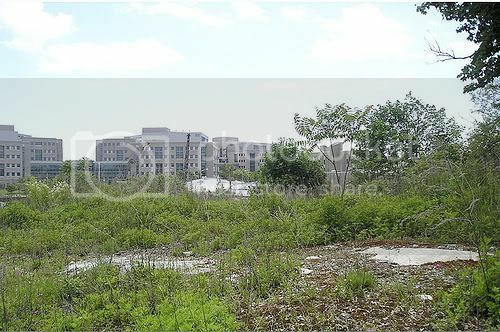 The plan was to demolish the residential neighbourhood so that Pfizer could built a massive research and development plant on adjacent land. Pfizer got the land for next to nothing. Five Supreme Court justices upheld the taking, ruling that although the primary beneficiary was a corporation, it met the constitutional requirement of "public use." Now Pfizer has announced it is shutting down the plant. Weeds, glass, bricks, pipe and shingle splinters have replaced the knot of aging homes. The promised new jobs and tax revenues vanished when the housing bubble popped and brought on a recession. <—The world is queer, because it is known only through representations that are fragmentary and in themselves queer. Their meanings are always relative, a matter of relationships and constructions. In contradiction to its title, this series (photographed in 1973 by Duane Michaels) seems to say that things themselves are not queer, rather what is queer is the certainty by which we label things normal and abnormal, decent and obscene. (I think the balance of that article isn't worth reading, but you can go there if you want.) Via The New Shelton wet/dry. 41. Saying "No problem" is a problem. It has a tone of insincerity or sarcasm. "My pleasure" or "You’re welcome" will do. A $20 donation buys 10-point credits to be used on two tests of the student's choice. A $30 donation buys the test points and admission to a 5th-period dance. A $60 donation buys students test points, the dance invitation, and a "special 30-minute lunch period with pizza, drink and the choice to invite one friend to join them." Photo ops with Rosewood principal Susie Shepherd, the vice principal, and a home room teacher go for $75. The photos will be posted on a school bulletin board and on the school's website. The principal said a parent advisory council came up with the idea and she endorsed it. She said the council was looking for a new way to raise money. "Last year they did chocolates, and it didn't generate anything." State education officials, who typically shy from talking about grading at individual schools, were not pleased. toward those who differ. The exact origin of the word is unknown, but it may have come from the German bei and gott, or the English "by God!" The hormone oxytocin, the "love hormone", affects behaviours such as trust, empathy and generosity. Previous studies have shown that oxytocin has a positive effect on positive feelings: it is released naturally during childbirth and when engaging in sexual relations. Participants in an experiment who inhaled a synthetic version displayed higher levels of altruistic feelings and the hormone plays an important role in the formation of relationships between people. However, the hormone is now known to also be related to higher levels of aggression. Of 56 participants, ½ inhaled synthetic oxytocin in the first session and were given a placebo (a dummy drug) in the second session; the others were given a placebo in the first session and oxytocin in the second. Then each participant was asked to play a game of luck along with another competitor, who was – without their knowledge – a computer. Each participant chose one of 3 doors and was awarded the sum of money hidden behind it - sometimes the participant gained less money than the other player, sometimes more. Those participants who inhaled oxytocin displayed higher levels of envy when the opponent won more money and gloated when they were ahead. As soon as the game was over, no differences between the participants were evident, indicating that the negative feelings were empowered by the game itself. Oxcytocin was being considered for use in various disorders such as autism - but the hormone's undesirable effects on behaviour are now causing a rethink. John Wearden, experimental psychologist, subjects people to 10 seconds of fast clicks (5 per second), then asks them to estimate the duration of a burst of light or sound. They believe that a 1-second stimulus lasts 10% longer than if they hear silence or white noise beforehand. It seems their central pacemakers accelerate. Wearden's former student, Luke Jones, tested the subjects' rate of mental processing - after exposing them to clicks, he measured how quickly they accomplished 3 tasks: basic arithmetic, memorising words, hitting a specific key on a computer keyboard. Results show clicks accelerate subjects' performance in all 3 tasks by 10 - 20% - as if the drumbeat of the brain's internal slave galley speeds up, compelling each neuron to row faster. White noise has no effect. "Information processing in the brain runs in subjective time," says Wearden. "Speed up people's subjective time and they have more time to process things." In one experiment, volunteers learned to play a video game in which they steered a plane around obstacles. Once people became used to the game, researchers modified it to insert a .2-second delay in the plane's response to computer controls. After the modification, players' performance initially worsened but brains learned to compensate to the extent that they actually perceived the movement of the mouse and the aircraft to be simultaneous. But the strangeness occurred then experimenters removed the delay and set the timing back to normal. Suddenly, players perceived the plane as moving before they consciously steered it - uncannily similar to how schizophrenics describe being controlled by another being. That gets to a core issue in schizophrenia - the question of whether you are in control of your own body. The ability to attribute actions to oneself versus others, to perceive one's own thoughts against thoughts generated from external sources, requires a tight coupling in time within the brain. Robert Parker is a wine taster. How good is he? How good are ANY of them? He blind tasted a 2005 Bordeaux, which he declared was the best vintage since 1982. He gave the wines at his 2005 tasting an exact point score. He did a blind retasting of these same wines in 2007. Did they score the same? What do YOU think? The answers were humbling. (In Parker's defence, these wines were still very young and tannic.) He confused merlot-based Bordeaux with cabernet-heavy blends; his favourite wine of the 2005 tasting turned out to be the lowest rated in his 2007 tasting. Frederick Brochet has shown that wine experts can be tricked by red food colouring into confusing red and white wines. Our brain has been designed to believe itself, wired so that our prejudices feel like facts. Our expectations of what the wine will taste like can be much more powerful in determining how the wine tastes than the actual physical qualities of the wine itself. Earth is quite an electrical planet! About 44,000 thunderstorms occur on it each day with about 2,000 in progress at any moment. The number of lightning discharges on Earth per second is about 100. It is unpleasant at best, dangerous at worst, to fly aircraft through thunderstorms as lightning, hail, severe turbulence, vigorous up draughts and strong downdraughts all occur inside them. An aircraft can be wrecked by flying from a powerful up draught into an adjoining downdraught. Even the biggest aircraft can be flung about the sky by the violent winds of vigorous cumulonimbus clouds. Pilots therefore try to fly around such clouds if they can. As the clouds are typically only 10 - 12 kilometres across, this is normally possible. Inside cumulonimbus clouds, up currents tend to be concentrated in "chimneys", with compensating currents of sinking dry air close by. Rain falls into the dry air, where it evaporates, thereby cooling the dry air, making it heavier. These downdraughts may become downbursts, blasts of cold air which are travelling with a speed of 40 metres per second or more when they reach the ground. The most severe types, called microbursts, can be very dangerous. People on aeroplanes are not the only ones endangered by microbursts. The strong, dry, gusty winds of downbursts can quickly turn a minor forest fire into an inferno. Microbursts can also overturn large boats. On 7 July 1984, for example, one overturned an excursion boat 27 metres long on the Tennessee River near Huntsville, Alabama, USA, killing 11 of the 18 aboard. The body harbours an estimated 100 trillion individual microbes inside and out. Together, they're called the human microbiome. Communities of bacteria living in one person’s distinct nooks and crannies differ from each other. While some places (such as the navel, forehead and armpits) are colonised with few kinds of bacteria, other places (including the back of the knee, palm and forearm) have many different types all living together. Microbiomes are also highly personalised. Gut, hair, nostrils, ear canals and skin bacteria are very different from person to person. Also, forearm bacteria doesn’t thrive after a move to the forehead but can live, for example, on the tongue. When someone gives you a wet kiss, they're really doing a lot of microbiome sharing. several dress-rehearsal run-throughs, and endless planning). I note the female leaders in the 2nd photo appear to be wearing guns - gender equality in action? This 65-metre-wide hole in the lunar surface extends at least 80 metres down and could be an opening into a larger lunar cave perhaps as much as 370 metres across. This discovery strengthens evidence for subsurface, lava-carved channels that could shield future human colonists from space radiation and other hazards... 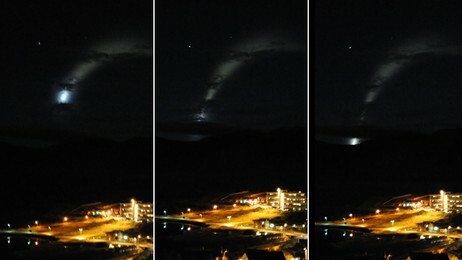 Strange light in the night sky over Norway: it was big as a full moon, and became larger and larger as a kind of explosion. It lasted 3 - 4 minutes and behaved like neither a comet nor a meteor. More photos here (via Naacal). 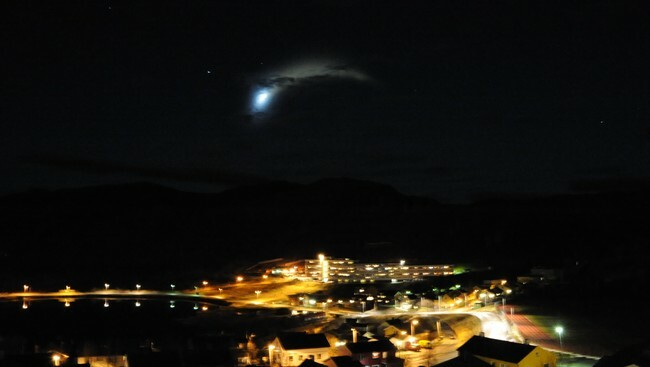 (I received an email from Stefan with the following information: "Being able to read the site about the strange lights over Norway I can report that they've figured out what it was. It was a Russian rocket test." Thanks!)... Indoor air is up to 12 times more polluted than outdoor air in some areas, with air quality affected by chemicals from paints, varnishes, adhesives, furnishings, clothing, solvents, building materials and even tap water. These produce volatile organic compounds, or VOCs, that have been shown to cause illnesses in people exposed to these compounds in indoor spaces. Horticulturists tested a number of ornamental indoor plants for their ability to remove harmful VOCs from indoor air. Of the species tested, purple waffle plant (Hemigraphis alternata) (also known as metal leaf), English ivy (Hedera helix), waxy leaved plant (Hoya carnosa) (also called wax vine or wax plant), asparagus fern (Asparagus densiflorus) and the purple heart plant (Tradescantia pallida) (formerly called Setcreasea pallida and also called purple heart wandering Jew and occasionally Moses in the basket although this usually refers to a different species) were best. We were springcleaning our garage and wished to dispose of our old CRT monitors (still operational, but who would want them? ); I figured that putting them into our rubbish bin was not on, but what should be done? Even Salvation Army didn't want them as they had a glut of old monitors. I found out that the city of Wellington will accept them - but only one day a year and they have to be carted around the harbour to Westpac Stadium. Unfortunately, the one day a year was in the previous month, so I had 11 months to go if I wanted to utilise that option. Several phone calls later, I found a place that would come and get them (there are 4) for recycling. But why was that so hard? Making disposal of such items easier could avoid problems long term. And I don't mean to imply that NZ is in some way unusual - I think they're much better than most countries. The US is one of the largest producers of e-waste but lacks federal policies on mandatory recycling and the elimination of hazardous materials in electronics. 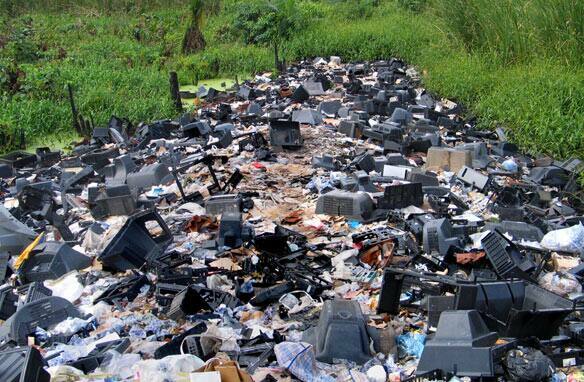 There are 1.36 million tonnes of e-waste - electronics that are broken or no longer useful - in storage in American homes. As well, most Americans are unaware of programs that are available for safe recycling and disposal. In Battery Park City, a "green" part of New York, in the apartment where I occasionally live, there is a large receptacle by the side door into which residents drop worn-out batteries of any size. These are then disposed of in an approved manner. There should be ample drop-off points for waste that should NOT go into a landfill. Since the 1990s, with the proliferation of small consumer electronic devices such as cellphones and portable music players, e-waste has become the fastest-growing component of the world's solid rubbish. Ethiopia (once known as Abyssinia) is one of the most ancient countries in the world, dating from the 10th century BC. It has the largest number of World Heritage sites of any country in Africa and around 80 different ethnic groups. The original home of the coffee bean, it may ultimately prove to be the place where homo sapiens originated. Unfortunately, it's one of the poorest countries on Earth but also has one of the fastest-growing economies in the world. It has large mineral resources and oil potential but also growing problems of deforestation and extinction of endemic fauna. Life expectancy is only 45 years due to high (8%) infant mortality and AIDS; 80% of women are "circumsised". Ethiopia has its own calendar based on the Coptic calendar, which is roughly 8 years behind the Gregorian calendar. Only about half of Ethiopians can read - but they do produce many world-champion track and soccer stars. Oh, and one other thing - the Rift Valley appears to be slowly dividing the country in half as part lies on the Nubian Plate and part on the drifting Somali Plate. One crack in the earth's crust, in the Afar region of Ethiopia, could be the forerunner to a new ocean. It ripped open in just days in 2005 when a volcano at the northern end of the rift erupted. The magma inside the volcano didn't reach the surface as lava – instead, it diverted into the continental rift underground where it cooled into a wedge-shaped "dike" that then uplifted, rupturing the surface and creating a 500-metre-long, 60-metre-deep crack. As the plates keep spreading apart, the rupture will end up looking like the Red Sea. I ran across this photo which I thought was striking (no, at this point I knew nothing about the movie - and still don't except that there IS one and this picture advertises it). What struck me as odd about these images is that, though they are quite similar, the 2nd has a much higher revulsion factor. Radio City Music Hall is the largest indoor theatre in the world. Its marquee is a full city-block long; its auditorium measures 160 feet from back to stage and the ceiling reaches a height of 84 feet. The walls and ceiling are formed by a series of sweeping arches that define a splendid and immense curving space. Choral staircases rise up the sides toward the back wall. Actors can enter there to bring live action right into the house. There are no columns to obstruct views. Three shallow mezzanines provide comfortable seating without looming over the rear orchestra section below. The result is that every seat in Radio City Music Hall is a good seat. The Great Stage is framed by a huge proscenium arch that measures 60 feet high and 100 feet wide. The stage is considered by technical experts to be the most perfectly equipped in the world. It is comprised of 3 sections mounted on hydraulic-powered elevators. They make it possible to create dynamic sets and achieve spectacular effects in staging. A 4th elevator raises and lowers the entire orchestra. Within the perimeter of the elevators is a turntable that can be used for quick scene changes and special stage effects. The shimmering gold stage curtain is the largest in the world. For more than 65 years audiences have thrilled to the sound of the "Mighty Wurlitzer" organ, which was built especially for the theatre. Its pipes, which range in size from a few inches to 32 feet, are housed in 11 separate rooms. The Hall contains more than 25,000 lights and features 4-colour stage lighting. And what's a show without special effects? Original mechanisms still in use today make it possible to send up fountains of water and bring down torrents of rain. 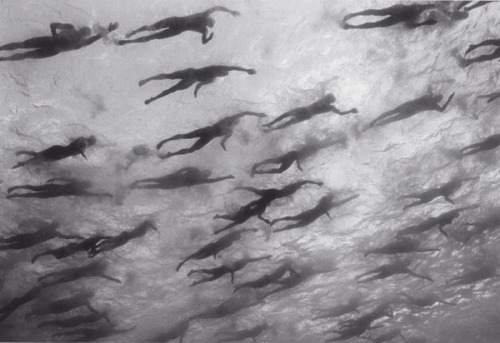 Fog and clouds are created by a mechanical system that draws steam directly from a Con Edison generating plant nearby... Swimmers in an ironman triathlon - an odd image by Wayne Levin. Guy Fawkes Day: We walked down to the Wellington Harbour to see the fireworks because we'd heard that there were several new types that had not been seen before. My guess as to the "new thing" in fireworks? Floral bouquets, perhaps? My son Wolf took these photos through the shrubbery in front of the St Gerard Monastery. Making Better Career Decisions (MBCD) was developed by collaboration between research teams at the Hebrew University of Jerusalem and the University of Oregon. It incorporates psychological principles, utilises research used to develop the Career Information System (CIS) at the University of Oregon, and incorporates economics, sociology and psychology to create a useful occupational database. This sounds like hype - and it might be - except of the 4 people (myself included) who used it, the results achieved on very little input seem to be shockingly close to the mark. (I should've been an architect - a conclusion I had reached only the week before, after years of introspection and MBCD could've told me that (and did) after less than 5 minutes of probing. Try it if you're deliberating among a number of careers or educational alternatives - you may find that some of them aren't compatible with your preferences, whereas others you have not considered beforehand may suit them. You may find MBCD useless for you - or not... Every so often in history, something profound happens that changes warfare forever. Next year, for the first time, the US Pentagon will buy more unmanned aircraft than manned, proof that war will be ever more abstract, distant, and ruthlessly efficient. All current Air Force Predator and Reaper pilots started off in real cockpits flying fighters, bombers, tankers, and cargo planes. The Army and Marines, which fly hundreds of small unmanned aircraft in Iraq and Afghanistan, rely on enlisted personnel who've never flown traditional aircraft - but those planes are unarmed and are used only for surveillance. Put missiles in the mix and concern grows. The Air Force has used UAV pilots who understand the mechanics and physics of flight as the new technology has developed - many have flown in combat over Iraq and Afghanistan. But fierce demand for UAVs is draining the pool of available pilots and what's the sense in spending a couple million dollars training pilots in planes they might never physically be needed to fly? Enter the Betas, the future armchair fighter jocks who grew up with the very technology of simulated flight. Those who dream of being real fighter pilots might never get the chance as the skies unman - but America's pool of gamers, texters, and TV watchers is certainly vast and deep - and their day may be at hand. You are being engineered by the government, to look like the Ideal Manhattanite - slim, sleek, cool as glass. All dogs go to heaven. Yours will probably get there in an urn: at the Francisco Funeral Home there is a modern, petite display of urns and headstones stamped "Fido" and "Rover." Halo-wearing puppies and kittens can't hide their somber purpose: to adorn the box holding a loved one. Everything around the Pet Crematory Agency (PCA) in Babylon says death. PCA breaks up its jobs into 3 categories: private individual cremations (one animal, one oven), private group cremations (multiple animals in different labelled baking pans in the same oven) and mass group cremations (many animals in one oven, no ashes returned). It does about 200 private cremations a week. Many have unique touches: "People want their pets done with a special item sometimes — a blanket, their doggie bed," says PCA administrator Lisa Clemente. Or an accompanying last supper, such as "a chicken cutlet, their favourite chew toy, or a bag of kibble or treats." Off the reception area is a small viewing room, normally used for a family to say its last goodbye to a pet after the staff has cleaned it up. But the room also has a tiny window covered with blinds. Once a pet has been taken away, the especially sceptical can raise the blinds and look right into the mouth of one of the crematorium's massive ovens. From this vantage point, a family can watch their beloved pet being put into the oven, to assure they are getting the proper cremains. Former bank executive Louis Clarke, owner of Pet Haven, finds services that freeze-dry dead pets and return them looking more or less like they did in life, unhealthy. "They take advantage of people who are inappropriately grieving," he says. "They don't need a freeze-dried pet. They need a therapist." But Chris Calagan of Perpetual Pet in West Virginia describes freeze-drying as "being like a picture, only better." The nature of the US economic crisis and the government's response now threatens to undermine the public's sense of the fairness, justice, and legitimacy of democratic capitalism. By allowing the conditions that made the crisis possible (particularly the concentration of power in a few large institutions), and by responding to the crisis with massive government bailouts of banks and large corporations, the US today risks moving in the direction of European corporatism and the crony capitalism of more statist regimes. This, in turn, endangers America's unique brand of capitalism, which thus far avoided becoming associated in the public mind with entrenched corruption and kept the country relatively free of populist anti-capitalist sentiment. Public support for capitalism in any given country is positively associated with the perception that hard work, not luck, determines success, and is negatively correlated with the perception of corruption. The US should abandon the notion that any firm is too big to fail and put rules in place that keep large financial firms from manipulating government connections to the detriment of markets. It means adopting a pro-market, rather than pro-business, approach to the economy. Thus far, this does not appear to be happening... Nothing seems to happen at first in this very short video - then US$250,000 in damage happens almost in the blink of an eye... This video is less than 10 seconds long - and is notable for what might've happened but didn't (via the inimitable Naacal - and you'll find 3 more interesting videos on their page if you're into that sort of thing). Frank Smith, and his son Donald patented their “ideal comb-over” technique in 1975. Their method involves dividing the hair into 3 pieces, then layering them to look as real as possible. Frank’s granddaughter reports that his technique tricked her for years: “You know how comb-overs have that stringly look? This is to avoid that. I didn't know for a long time that he even had a comb-over.” (Via Hair Loss Blog). About 70 million people in the US, most of them men, are either bald or losing hair, according to the American Hair Loss Council. But the number of hair transplants being performed is plunging. The economy has a big impact - after all, transplants cost thousands of dollars and, because they're cosmetic, are never covered by insurance. Samuel Jacob Popeil (SJ) was a pitchmen (Pocket Fisherman, Veg-O-Matic, Chop-O-Matic). In 1974, SJ's second wife, Eloise, decided to have him killed, so she hired two hit men - one of whom, aptly, went by the name of Mr Peeler. At the time, she was living at the Popeil estate in Newport Beach with her two daughters and her boyfriend, a 37-year-old machinist. When, at Eloise's trial, SJ was questioned about the machinist, he replied, "I was kind of happy to have him take her off my hands." That was vintage SJ. But 11 months later, after Eloise got out of prison, SJ married her again. That was vintage SJ, too. As a former colleague of his puts it, "He was a strange bird." He was also the father of Ron (Mr Ronco Showtime Rotisserie & BBQ and the infamous spray-on hair) Popeil. Hair-building fibres are sprayed from a container onto the scalp to create the appearance of hair over thinning areas. They bond to existing hairs through static energy. It creates the look of hair in the balding area and can also make hair appear thicker. It will not run, melt of stain but the more hair a person has the better the product works. It looks more noticeable on balder people and doesn’t work as well. It is also (unsurprisingly) more obvious up close. Best advice for those with comb-overs? Stay out of the wind.